The Bridge: it's coming, though we don't know when. PRESS RELEASE: Ableton and Serato are proud to announce The Bridge at NAMM 2010 in Anaheim, California. The Bridge spans the gap between music production and DJing, creating a natural link between Ableton Live and Serato Scratch Live/ITCH. The Bridge provides a powerful fusion of DJ and production tools, opening a world of opportunities for DJing, remixing and live performance. The Bridge provides Ableton Transport Control (ATC), giving DJs turntable-style control of their own multitrack productions. 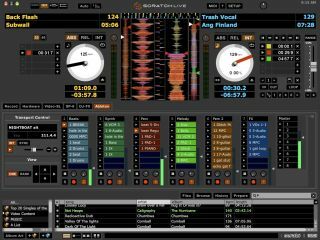 DJs can simply drag an Ableton Live Set onto one of the decks in Scratch Live or ITCH and use their turntables, CDJ or ITCH controller to control the transport. The Bridge provides the ultimate mixtape creation tool. DJs can perform mixes in Serato Scratch Live or ITCH and save them as an Ableton Live Set. This way, the DJ can still perform the mix—better than cut and pasting it together in a DAW—but also has detailed editing options. "Seeing where Ableton is at this state of technology, and all the stuff that's in there, and thinking about Ableton and Serato together is mind boggling. I know there's a lot of stuff that can happen... we're all producers, we're all DJs, your mind starts to wonder what's coming. Everybody's gonna get excited." The Bridge is free for anyone who owns registered versions of both Serato Scratch Live/ITCH hardware and Ableton Live 8 or Suite 8.